Accommodation in Deluxe A/C room for two persons. Child up to 5 years will be complimentary. Hotel Saheli Palace is located in the heart of city, attached to the main commercial centers and walking distance from famous Udaipur tourist attractions like the Sahelion ki Bari, Fatehsagar and also close to Bhartiya Lok Kala Mandal. 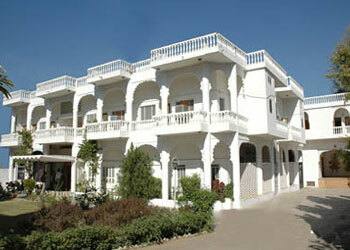 Hotel is just 3 kms from Udaipur railway station. All rooms are well appointed and cozy. Rooms come in two varieties: air-cooled and air-conditioned. Rooms have attached bathroom with hot/cold water, colour TV, direct dial telephone, etc. Hotel has a multi-cuisine retaurant, 24-hours room service and travel desk to satisfy your travel needa during your stay at the hotel. 222/17, Saheli Marg , Udaipur - 313001 . 1st Day sightseeing to Lake Fateh Sagar, Pratap Smarak, Sahelion ki bari, City Palace, Jagdish Temple, Dudh Talai. 2nd Day sightseeing to Eklingji, Nathdwara And Haldigati. 10% discount on shopping from our handicraft showroom.